Jordan Brand made another surprising move this month after releasing a new colourway of the retro edition of the Air Jordan 5, which is tagged as the most retroed Jordan shoes ever. 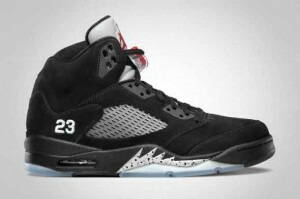 Previously released in various colourways before, the Air Jordan 5 Retro is currently getting a lot of attention in the market after the release of the Black/Varsity Red – Metallic Silver colourway of the shoe, which was not originally included in Jordan Brand’s lineup for August 2011. If you want to experience greatness at its best once again, don’t hesitate to get this for you will never regret your decision!